Home > News > Ateliers Lydie and Suelle... take to the golf course? Ateliers Lydie and Suelle... take to the golf course? Well, here's a collaboration I would never have guessed at. Gust's Atelier Lydie & Suelle is a delightful JRPG about two girls and their dreams to become master alchemists. And, apparently, they play a mean game of golf, with a special collaboration event with Everybody's Golf. From April 19 (in Japan at least, not sure about the west), you'll be able to jump into your copy of Everybody's Golf and obtain special Lydie and Suelle costumes. 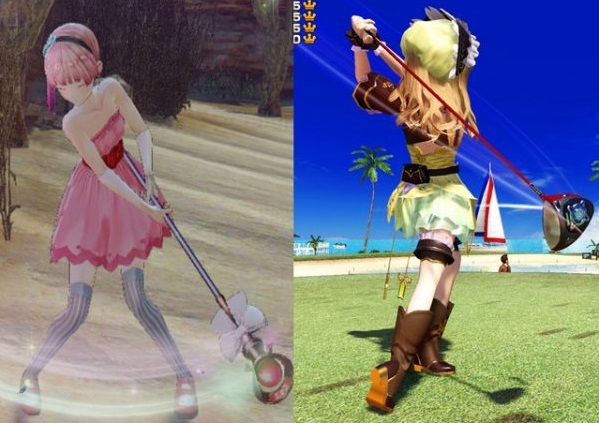 Meanwhile, over in Atelier Lydie & Suelle, you'll be able to grab costumes for Everybody's Golf's Erica and Gloria. Naturally this only applies to the PlayStation 4 version of Atelier Lydie & Suelle. These costumes are free in Atelier Lydie & Suelle, and will set you back 500 Gold Coins in Everybody's Golf. These collaborations are getting weirder and weirder. Not that I'm complaining.